My research theme is materials for alternative energies and fuels. 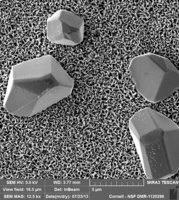 The material that we are investigating currently are nanocrystalline cuprous oxide (Cu2O) and iron oxide (Fe2O3). By illuminating the nanocrystalline oxides in water with sunlight, the photon energy can be absorbed by the nanocrystalline oxides and can be converted to electricity. 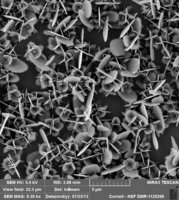 Our ultimate goal with nanocrystalline Cu2O is to generate hydrogen gas by splitting water (i.e., the production of an environmentally friendly energy source in an environmentally sensible manner) and incorporating greenhouse gas, CO2 into alcohols (CH3OH, CH3CH2OH -- other environmentally sensible production of fuels) at the surface of illuminated Cu2O electrode. The current goal with nanocrystalline Fe2O3 is to reverse the electron flow direction of the material, so the reduction of H+ and CO2 can be performed on Fe2O3 surface. 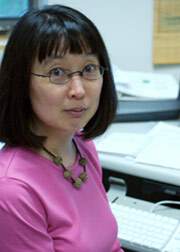 Akiko Fillinger received her B.S. 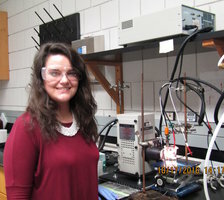 in Chemistry in 1995 from Portland State University where she became interested in chemical solar-to-electricity conversion under the guidance of Professor Carl Wamser. She went on to perform her graduate work at Colorado State University in Fort Collins where she received her Ph.D. in analytical chemistry in 2000. 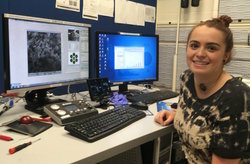 For her graduate thesis, she studied dye sensitized nanocrystalline TiO2 solar cells with Professor Bruce Parkinson. In 2001 she became a Dreyfus Post-doctoral Fellow in Environmental Chemistry at the Division of Applied Sciences and Engineering at Harvard University in Cambridge, Massachusetts (Professors Steven Wofsy and Scot Martin). After the post-doc experience, she taught for a year at Grinnell College at Grinnell, Iowa as a visiting assistant professor. She began teaching at Ithaca College in the fall of 2003, and has taught Principles of Chemistry, Physical Chemistry (Thermodynamics & Kinetics, Quantum Mechanics), Instrumental Analysis, Quantitative Chemistry, Electrochemistry, Environmental Chemistry and Experimental Chemistry I, III - V.
Kaitlyn DeHority, Noah Budin, Samantha Hilston, Yongqian (Kelly) Zhang, and Akiko Fillinger, “Deposition of Nickel on Electrodeposited Cu2O at Potentials More Positive than the Nernst Potential of Ni2+/Ni0”, Journal of the Electrochemical Society 164, H615-H620 (2017). Alyssa de Villiers (Faculty Advisor: Akiko Fillinger), "Investigation of an Herbal Dewormer as an Alternative Treatment Method. 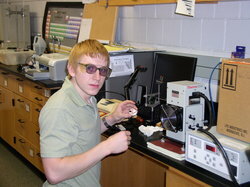 Part II: Chemical Analyses with HPLC and Handheld XRF", Proceedings of the National Counference on Undergraduate Research (NCUR) 2010, 732-744 (2010). Kelly L. Sowers and Akiko Fillinger, “Crystal Face Dependence of p-Cu2O Stability as Photocathode,” Journal of the Electrochemical Society 156, F80-F85 (2009). Clifford J. Engel, Thomas A. Polson, Jacy R. Spado, Jennifer M. Bell, and Akiko Fillinger, “Photoelectrochemistry of Porous p-Cu2O Films,” Journal of the Electrochemical Society 155, F37-F42 (2008). 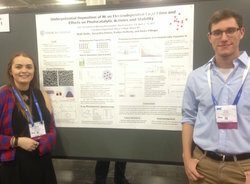 Samantha Hilston (Biochemistry '18) and Noah Budin (Chemistry '18) presented a poster, "Underpotential Deposition of Ni on Electrodeposited Cu2O Films and Effects on Photocatalytic Activity and Stability" at the American Chemical Society National Meeting at San Francisco, CA in April 2017. 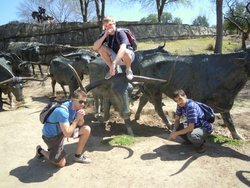 Noah Budin (Chemistry '18) performed an oral presentation titled, "Underpotential Deposition of Ni on Cu2O and Its Effects on Reactivity and Stability of Cu2O Films" at the Electrochemical Society National Meeting at San Diego, CA in May 2016. 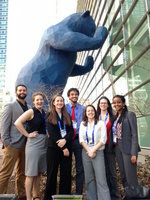 Kaitlyn DeHority (Chemistry '16) presented a poster titled, "Activation and Stabilization of Electrodeposited Cu2O with Underpotentially Deposited Ni" at the American Chemical Society National Meeting at Denver, CO in March 2015. 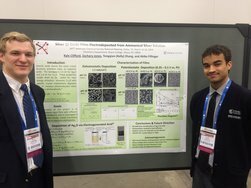 Kyle Clifford (Chemistry '14) and Zachary Jones (Chemistry '15) presented a poster titled, "Phase and Morphological Variations of Silver Oxide Films Electrodeposited from Ammonical Silver Solutions" at the American Chemical Society National Meeting at Dallas, TX in March 2014. 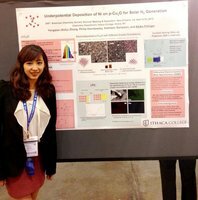 Philip Davidowsky (Physics '13) and Yongqian Zhang (Chemistry '14) presented a poster titled, "Underpotential Deposition of Ni on Cu2O for Solar H2 Generation" at the American Chemical Society National Meeting at New Orleans, LA in April 2013. 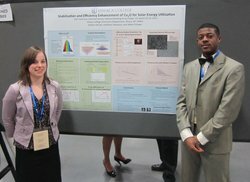 Delbert Shoals (Chemistry '12) and Kathleen Sampson (Chemistry '13) presented a poster titled, "Stabilization and Efficiency Enhancement of Cu2O for Solar Energy Utilization" at the American Chemical Society National Meeting at San Diego, CA in March 2012. 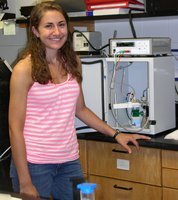 Sarah Fields (Biochemistry '10) presented a poster titled, "Investigation of SHArK (Solar Hydrogen Activity Research Kit) Template with Optical Microscope and Handheld X-ray Fluorescence Spectrometer" at the American Chemical Society National Meeting at Boston, MA in August 2010. Ian Weiss (Chemistry '10) and Layne Kasprzyk (Environmental Science with Chemistry Concentration '10) presented posters titled, "Protecting Cu2O Film from Decomposition While Attracting H+" and "Improvement of Biodiesel Quality with Increased NaOH, Methanol, Reacion Time, and Settling Time" at the American Chemical Society National Meeting at San Francisco, CA in March 2010. Joshua Thomas (Chemistry '10) gave a talk, "Use of Metallic Overlayer for Cuprous Oxide Stabilization" at the National Conference on Undergraduate Research 2010 at Missoula, MT in March 2010. Angela Asala (Chemistry '16) preparing for experiments in our lab. 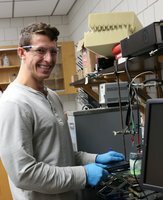 George Clause (Biochemistry '16) electrodepositing Cu2O.